Pardon the ambitious title, but I would like to make a post about making a good end times theory. A loose definition for a theory is "an explanation that best accounts for all the facts we have." We make end times theories based on Scripture, and see how those line up with world events. Indeed, the "EU as the end times Roman empire" is an end times theory, but one that I believe is strongly based on Scripture. We used to have an end times theory on who the Antichrist was. We thought that theory was really good. But the theory, at least as it was formulated at the time, turned out to be wrong. Obviously, we are all interested in the truth, even if that leads us to inconvenient places. What we need to use, when analyzing end times theories, is criteria for a good theory. The characteristics of good theories in general are actually the criteria we need to use for building end times theories. Explanatory scope - does the theory provide a decent explanation of all the facts, or just some of them? Example: "Jesus disciples hallucinated him after his resurrection" does not have good explanatory scope, because it doesn't explain other details, such as the empty tomb. It leaves loose ends "hanging." Explanatory power - does the theory provide a good explanation of all the facts, or do we have to force it? Example: "Jesus resurrection story is just a metaphor" does not have good explanatory power. Even though it explains all the details, it doesn't explain them very well. Plausibility - is this theory likely, given other background information we have about the same subject? Example: "which is more likely, Jesus resurrection, or multiple simultaneous group hallucinations occurring to several different types of individuals?" Though people don't rise from the dead on a regular basis, multiple group hallucination seems even more "impossible" than a resurrection. Less ad hoc (ad hoc means contrived) - does the theory have to make up other facts out of thin air, just to explain this theory? How much does it "force it?" Example: "Jesus didn't rise from the dead, his long lost twin brother stole the body, then pretended to be Jesus in front of his disciples." Illumination - Does our theory answer other questions about other subject matters and open up other areas of inquiry? Example: does Jesus resurrection help us answer other questions as to why the early Christians behaved the way they did? Yes it does. Simplicity (this is not on Licona's list, but its very important) - is the theory the simplest explanation of all of the facts? Example: "Disciples hallucinated Jesus after his death, but someone else stole the body" is not a very simple theory, because it has two different explanations, instead of one. Falsifiable/testable (this is not on Licona's list, but its also very important) - can you at least, in principle, prove the theory wrong? Example: "Jesus disciples hallucinated the resurrection of Jesus" is very UN-falsifiable because there is nothing you could say to prove it wrong. Imagine someone using a "hallucination defense" in a court room, and claimed that all the witnesses to their murder were merely hallucinating. What could you say to prove them wrong? It would be really hard, because the theory is in principle, permanently safe. I remember reading about many of these when taking my philosophy of science class (which, as you can guess, focuses a lot on what a good theory is). But Licona does a great job of listing all of them together. Dr. Licona often debates people who do not believe in the resurrection. Usually, his opponent has some other theory to explain the historical facts, other than the resurrection. What Licona does in debate, is show how the resurrection "theory" meets all 5 of this criteria much better than the opponents theory (i.e. the disciples stole the body, the disciples hallucinated Jesus after his resurrection, etc.) He does a fantastic job, and is probably one of the best experts on the resurrection today. So How Does this Relate to Prophecy? According to philosopher Richard Swinburne, the best theory is the simplest explanation that accounts for all the facts. As you can see, Richard Swinburne's definition is basically a shorter version of Licona's. These are the things we need to keep in mind when evaluating all theories in life. ...And they are the things we need to keep in mind when evaluating a theory about prophecy. When making a theory about who the Antichrist is, or prophecy in general, we need a simple theory that accounts for all the facts that doesn't force the details (i.e. is not ad hoc). Also, it needs to be "testable." There has to be some way to prove it wrong. The original ENPI/WEU/666 theory was a good theory. It was simple and "unifying." It explained all the facts quite well and everything seemed to "fit together" pretty good (i.e. explanatory scope). It also had very good "predictive" power. It was "testable" in that it could be proven wrong. All we had to do was wait for the midpoint. But the theory's validity took quite a hit when Javier Solana retired before the midpoint. The theory was still simple, unifying, and explained all the facts, but it involved a lot more "force fitting." It became much more "ad hoc" (i.e. contrived). We had to postulate an additional fact that wasn't supported by any other evidence. We had to suppose Solana would not retire, despite having all the evidence say that he would. Furthermore, it was no longer testable or falsifable after the midpoint. Is The EU Theory a Good Theory? While we may have been wrong about Solana, I don't think we are wrong about the EU. I think the EU theory is very well-supported, especially if we set it up to make "modest" claims. I will be having two blog posts today. This is probably the less interesting one. But I think it's important to look at the features of a good theory. If Solana were to be the appointee then he would have been well hidden. do not have the stomach to promote this possibility. It would be picture perfect however and yet hidden to other ignorant but well versed Bible prophecy scholars who we would excitedly feel the need to inform. 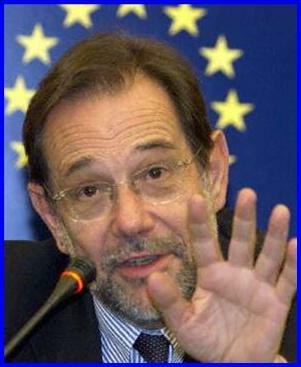 While it is extremely unsatisfying to followers of the theory and very very possible to be incorrect until Javier Solana is dead ....he remains the best candidate to fulfill prophecy. If actual nuclear war was on the horizon today he would be brought in and the lady out. Her experience and knowledge is probably on all fronts 1/10 or less of his. The Italian foreign minister is equivalent to a nurse practioner Solana is the emeritus professor of medicine at age 72 . She would be removed immediately and the professor brought in if nuclear war threatened.. All is well for the nurse practioner when the patient has a sinus infection but in the face of a life threatening disease which is spreading to the community she is out.